By the time the morning sun roused me from my futon, Misako was hard at work in her cramped little kitchen. As my host mother, she was determined to show me Japanese courtesy. She made me fish and curry, rice and pickled vegetables. And she made me natto. Natto! I’d never had it before, but I was hooked. And Misako was utterly shocked by my taste for this stinky-gooey-slimy mess in a bowl. That trip to Japan was many years ago now, but I’ve always retained a great affinity for these fermented beans, full of protein, vitamins and disease-fighting properties. Lots of people don’t like natto. Even my Japanese friends raise their eyebrows when I mention the word. You know those squooshy, oozy banana slugs that populate the Pacific Northwest? Well I’ve never eaten one, but I imagine their slimy trails to have the same consistency of natto. I understand why people turn their noses — but not I. I like just about anything a bean will do. 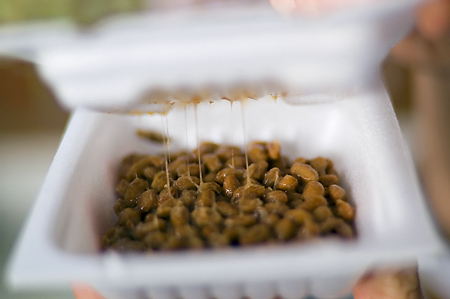 When we lived in Oregon, I’d hit the Asian markets in Eugene and stock up on little packets of natto (easily kept frozen). Japanese ingredients were common there. But here in Thailand, non-Thai Asian ingredients can be tricky to find. So I was delighted to discover these nifty natto containers at a local supermarket the other day. There’s a trick to fixing natto. It needs to be whipped. 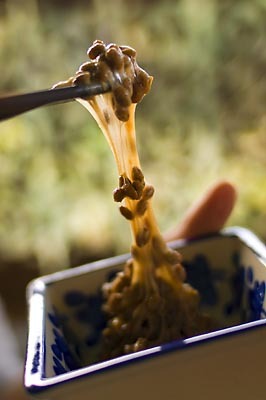 Stir and stir and stir with a spoon or chopsticks until you’ve made a gloppy mound of bean goop. Add hot Japanese mustard (usually included in the package), soy sauce, chopped green onions or flakes of dried seaweed. Serve with rice, and get yourself sticky. What a breakfast! It’s a rather rebellious dish for Japan, ancient though it is. I think that’s why I respect it so. I mean, you can’t eat natto and not get dirty. You’ll leave the table with little strings of bean hanging from your chin, little tendrils devouring your face. Not exactly the picture of Japanese daintiness. I love it. I have a feeling I would like this, but it looks too much like the cauldrons of larvae they cook and eat as street food in Korea. Worst. Smell. Ever. Beautiful pictures…I have never had this before, but would love to try this one day! I used to eat it straight out of the package for breakfast some mornings! Wow. Natto on spaghetti — now that’s an idea. Kitty, I think you might like this indeed. But dear, if you do, there is no question about it: your tastes have changed dramatically since our Montana days. 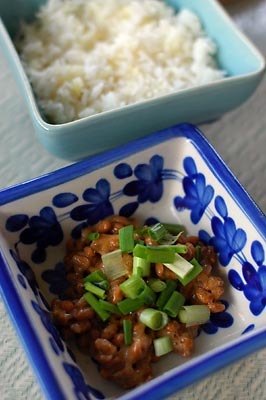 Rasa, if you like belacan you’ll probably like natto. They’re both in the same family of stinky (yummy) stuff. I know, I know, I’ve acquired some strange tastes over the years. But I’ll say this much: while I love natto, I’m not so sure about the REAL grubs they serve up around here. I’ll do beans. But I’m not big on insects and other small critters. I have to say Karen- your tastes have become much broader and adventours over the years- you too have come along way from the Montana days! I seem to remember everyone thinking I was the crazy girl from Hawaii for wanting sushi and -gasp- eating raw fish! Looks like now I can learn a few things from you- I might have to go check this stuff out since you did make it sound quite interesting. Happy – Absolutely! Back in our Montana days, I never would have predicted a lifestyle that included raw fish at least once a week. And fermented fish, which I eat in one form or another every day. I’ve moved way beyond the California rolls (although the sushi shop near our place has some, um, interesting Philly rolls with cream cheese). I think you might like natto. Let me know. Last week when I did grocery shopping at Uwajimaya I found that they have a whole aisle dedicated to Natto, I figured I might as well pick up some and see what it was like. Now there were many different varieties and all the packaging in japanese which I don’t understand so I picked the one with some english writing which ended up not helping much it listed ingredients and the nutritional info but no directions or serving suggestion. I have to say it took me a few days to try it- I whipped it as you suggested, had rice on the side and took a bite- and my initial feeling was that this was not an instant favorite. I have 2 more packages in the freezer so I will try again and see if I can acquire a taste for it! Perfectly understandable. You may never acquire a taste for it. Lots of people don’t. But I’m excited that you were inspired to try it!